A commemorative speech is used to praise and pay tribute to a person or a group. The aim behind Commemorative Speech Examples is to express desires, feelings, and emotions such that it should inspire others. The eulogy, nomination speech, goodwill speech, wedding speech, award acceptance speech etc are commemorative speech types. There is a proper format for writing a commemorative speech. It is totally different from informative and persuasive speech format. Below is a list of commemorative speech examples including Graduation Speech Examples, ceremonial speech examples and funeral speeches. 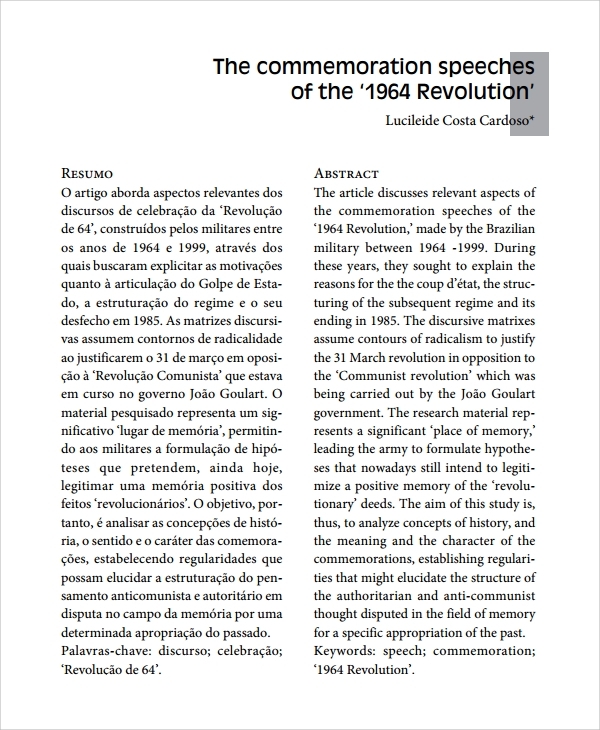 Download the speech and read it for better comprehension. Prepare an effective commemorative speech easily. Commemorative speech outline PDF is a guide that will surely help you in writing an inspirational speech. Download the document and read it for better understanding. 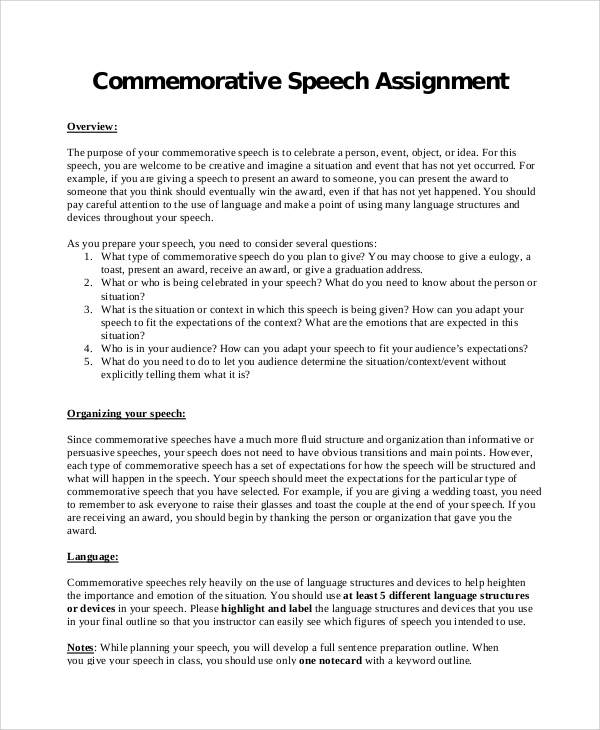 Learn the purpose of commemorative speech, how to organize it, language structure, and notes. 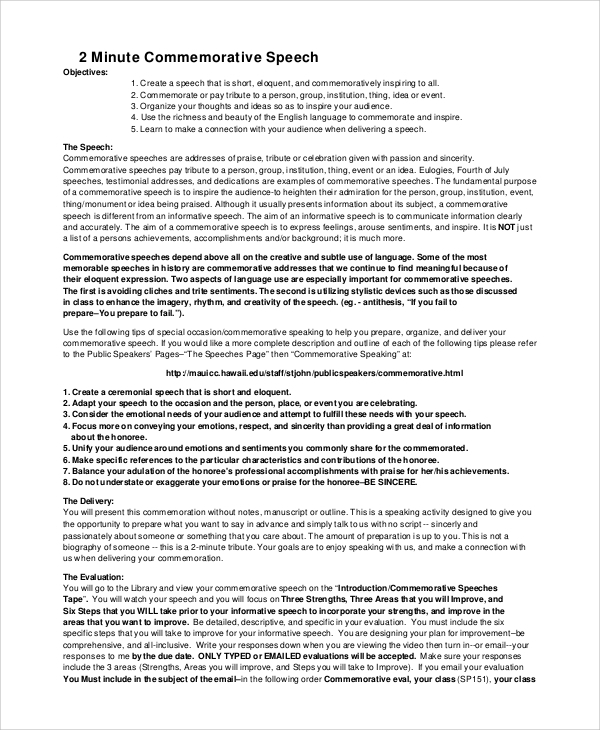 If you have some confusion, relate regarding commemorative speech initiation then you should download commemorative speech introduction example. Motivate your audience by writing an effective commemorative speech introduction. It also explains informative and persuasive speech writing in detail. Commemorative graduation speech PDF is a sample graduation speech document. Excellent copy writing, formal tone and easy readability will help headmasters and professors in writing effective commemorative speeches. 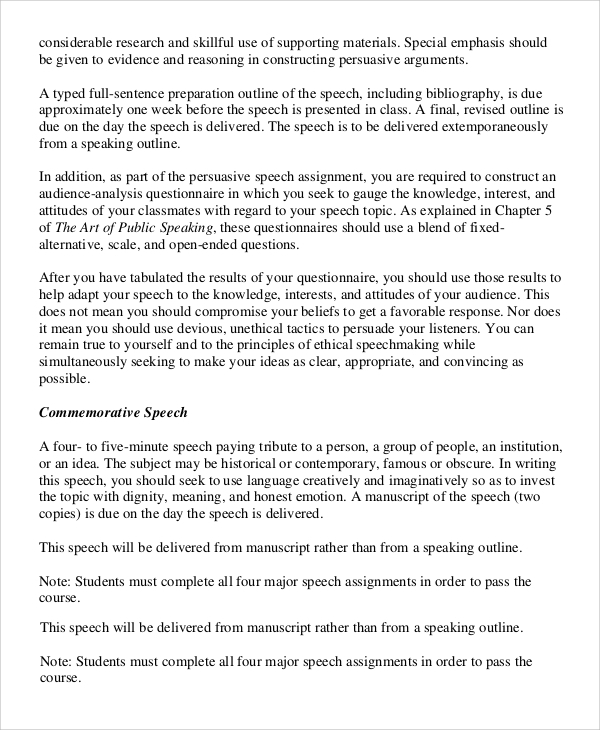 If you do not know anything about commemorative speech writing then Commemorative speech examples PDF is made for you. 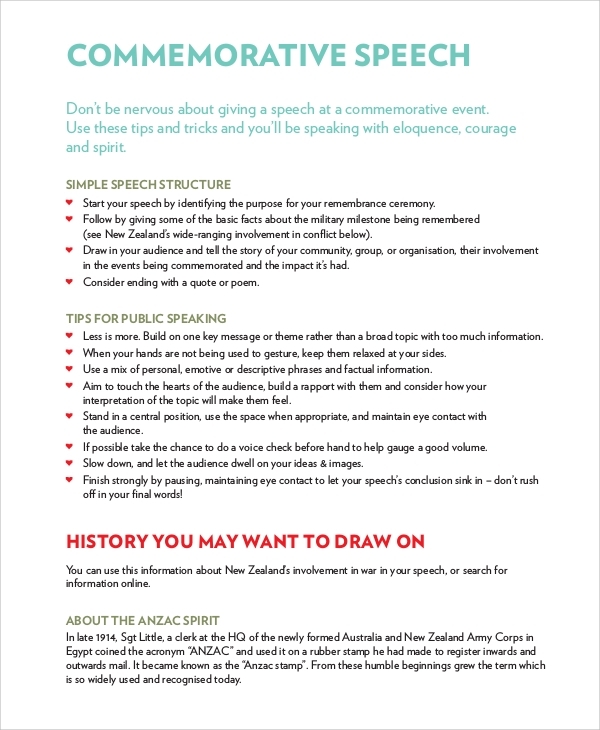 Learn the art of structuring commemorative speech with tips and notes. Also, it includes a speech example for reference. Read the document and deliver your thoughts effectively. How to Use the Commemorative Speech Examples? Expressing your ideas and thoughts into inspirational speech has never been easy. It cannot be done by informative speech communication. So, commemorative speech is used to share your feelings and desire in an inspirational manner. Commemorative speech is different from informative speech writing. 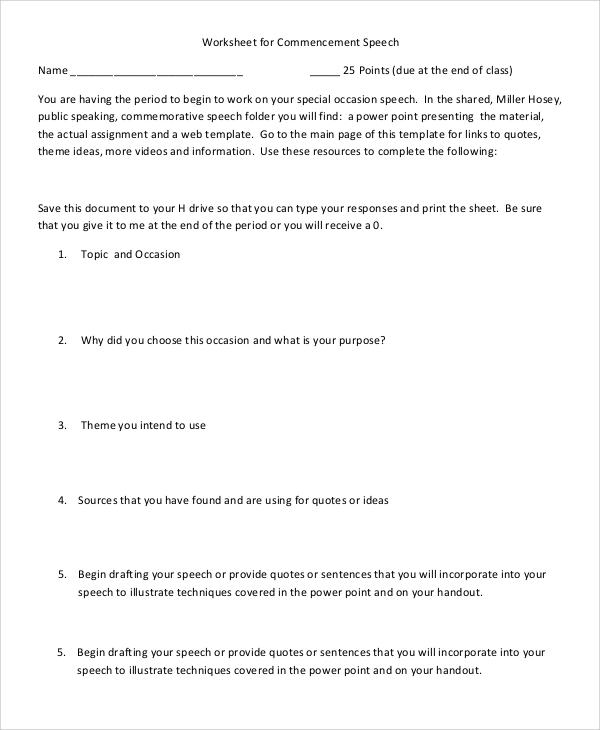 Take a look at the Informative Speech example and explore the way of writing effective informative speeches.